I recently read that 1,000 books about happiness have been released on Amazon in the past three months. 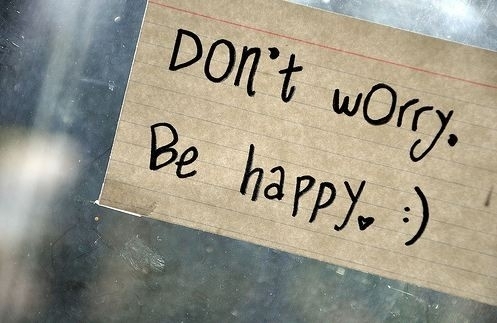 “Don’t worry. Be happy” is not only a catchy song; it has become the meaning and goal of life. But what happens to the increasing segment of society where the individual and his/her loved ones must confront the reality of a cancer diagnosis? What do we do with this push toward maintaining happiness at all costs? Each of us has a personality structure that in some sense foretells how we and our families will react. I spoke with one woman while volunteering with Cancer Hope Network who asked me how to hide her diagnosis and hair loss from her family and closest friends. I didn’t argue with her. This was her way of coping. She had resolved to continue not worrying and being happy externally as a way of avoiding dealing with her and others’ fears. Another woman refused to ask her oncologist what surgery she was getting, what stage cancer she had, and whether she needed chemotherapy. She told me she instructed her doctor to just tell her when to show up and do what he felt he had to do for her. She returned to her active social life directly after finishing her treatment. What about those of us who have experienced suffering, and can’t just put on a happy face to fool ourselves or others? “It was a blessing for me,” some tell us. Are they being honest with themselves? I believe they are, if their suffering sends them beyond the external image we share with one another, and deeper into our unique selves. What of our religious or spiritual beliefs? Do they hold up under the stress of not knowing how this situation will resolve? What about the life we had been living the day before our diagnosis? I recall leaving the doctor’s office that night and realizing most of the plans on my busy schedule would have to be shuffled or erased while I dealt with this new aspect of my life. What limitations would illness place on my future? What could I control, and what was outside of my control? I made several mistakes in predicting this part of my “new normal” life. I also felt a new call. I had to make meaning of this suffering, this horrible experience, as so many other men and women have managed to do. We have plunged down into the basement of our being and discovered that there is an “up” from that dark place. We will give of ourselves to others. We will volunteer, we will be more empathetic, we will write a book, create a foundation, or fund new research. We will cut ourselves some slack and nurture ourselves as we have done over the years for others. We will draw new boundaries around what we now consider acceptable treatment of us. We will leave old friends who were toxic for us, and find new ones who fulfill our new desires and goals. This is a blessing or gift not sought by any of us. But we can see ourselves more than just folks rushing after the next happiness experience. We can feel ourselves joining with others, across all sorts of cultural, religious, and national boundaries. We can feel ourselves connected to so much more.